Stanley Cup at the Hockey Hall of Fame Close up view of cup. 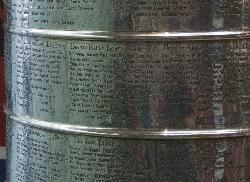 Close up view of the cup of the Stanley Cup, at the hockey hall of fame, in Mat of 2011. Photo of the Ken Dryden mask in Hockey Hall of Fame Mask. 1966-73 Mask. Wore as member of the Montreal Canadiens. 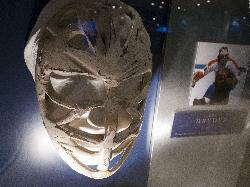 Photo of the Rogie Vachon mask in Hockey Hall of Fame Mask. 1971-73 Mask. Wore as member of the Los Angeles Kings. from site: In the late 1960s and early 1970s, the Montreal Canadiens had no room for under performers on their team. On the famous club's roster, there were enough talented and highly experienced players to put together several teams. Like all top teams, the old guard gradually retired and the team had to be reinforced with young players. But rookies spent as much time in the press box as on the ice. 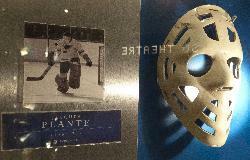 Photo of the Jacques Plante mask in Hockey Hall of Fame Mask. 1969-70 Mask. Wore as member of the St. Lois Blues. from site: After being struck in the face by an Andy Bathgate backhander (and taking seven stitches), became the first goaltender to wear a mask regularly, November 1, 1959. 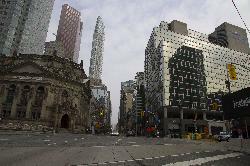 Photo looking north on Yonge Street in Toronto at the intersection of Front Street. 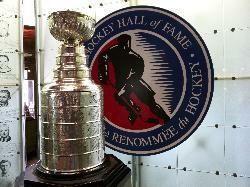 Viewable are the Hockey Hall of Fame, Scotia Tower and the One King Street Tower. 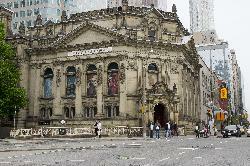 Photo of the Hockey Hall of Fame bulding at Yonge Street and Front Street in Toronto Ontario. NHL. IIHF. This building was previously a Bank of Montreal building. 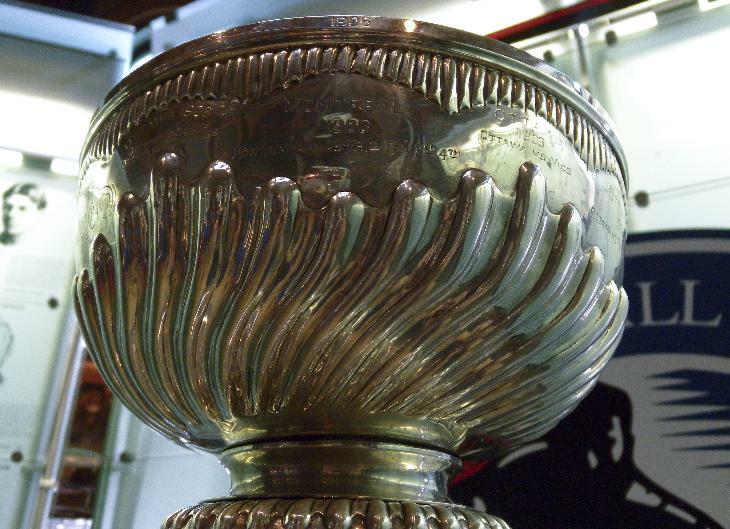 Photo of all the members of the 1966-1967 Toronto Maple Leafs on the Stanley Cup. Taken in Hockey Hall of Fame. Includes Dave Keon, Frank Mahovlich and Tim Horton. 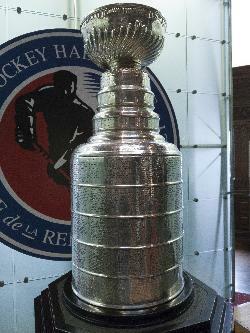 Photo of the Stanley Cup on display at the Hockey Hall of Fame. Amongst the plaques of all the hall of fame members.